Longsleeve pullover with "A. 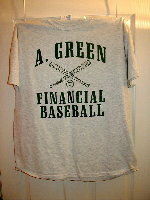 Green Baseball" on left chest. Perfect for spring and fall weather. Available in S, M, L, XL, and XXL. A. Green Baseball adjustable caps in green with white center button and eyelets. A. 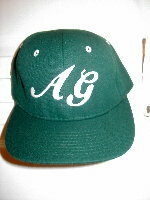 Green Baseball fitted caps in green with white center button and eyelets. A. Green Baseball fitted caps in white with green center button and eyelets. Short sleeve tee-shirt with "A. Green Baseball" across the front. Short sleeve 2-button polo shirt. Grey in color with "A. 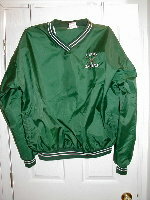 Green Baseball" and crossed bats and ball on left chest. A. Green Baseball Hat/Shirt button. 2" size.